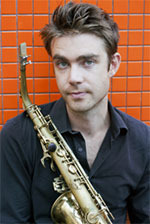 Jeremy is a saxophonist, composer, academic and founder of the record label Earshift Music. He regularly writes and performs with his co-led projects the Strides, the Vampires, the Jeremy Rose Quartet, Compass Sax Quartet, duos with pianists Mike Nock and Jackson Harrison, and his Earshift Orchestra. Jeremy also performs as a sideman in Cameron Undy's 20th Century Dog, Ensemble Offspring, and Phillip Johnston's Greasy Chicken Orchestra. Jeremy Rose has performed at festivals, concert halls and jazz clubs throughout Australia and has had multiple tours to Europe, the UK and Japan. He has studied jazz and non-Western music in places including New York, London, Oslo, Bali, Havana, Greece and Banff. Jeremy is equally cognisant as a classical composer and has had his works performed by Ensemble Offspring, Acacia String Quartet, saxophonist Nick Russoniello, the Conservatorium Modern Music Ensemble and Jazz Orchestra, and the Sydney Symphony Orchestra Fellowship. Jeremy holds a Bachelor of Music in Jazz Performance (Honours Class I) and a PhD in composition Sydney Conservatorium of Music. Jeremy's accolades include the 2015 APRA Professional Development Award and the 2009 Bell Award for Young Australian Jazz Artist. He was a Freedman Jazz Fellowship Finalist in 2012 and 2013. Jeremy was a finalist in the APRA/MCA Art Music Awards in 2012 and 2013 for Jazz Work of the Year and Excellence in Jazz. In 2016 Jeremy curated the inaugural APRA Jazz Song Hub in Berlin in a collaboration featuring US guitarist Kurt Rosenwinkel. The media has reported that 'his compositions stand out from the pack' (SMH), he 'is developing into a significant Australian voice' (Jazz-Planet.com), and that 'his playing shows subtle glimpses of a mature master' (The Australian). He is also a passionate teacher, has given masterclasses and lectures on improvisation, composition, saxophone and career development in the arts at tertiary and secondary levels. Liminality : for chamber orchestra (2016) Commissioned by SCM Modern Music Ensemble.